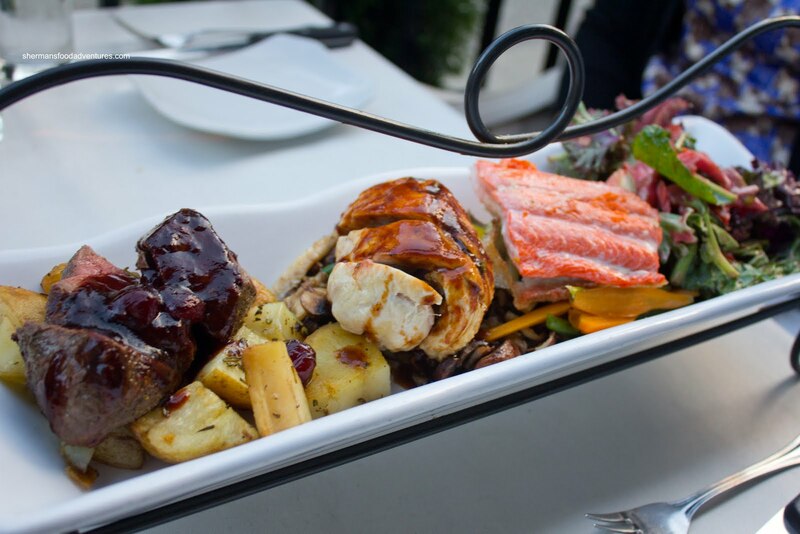 With all the great bistros we have in Vancouver, there are some that get lost in the shuffle. It is especially true if they are not situated at a central location. 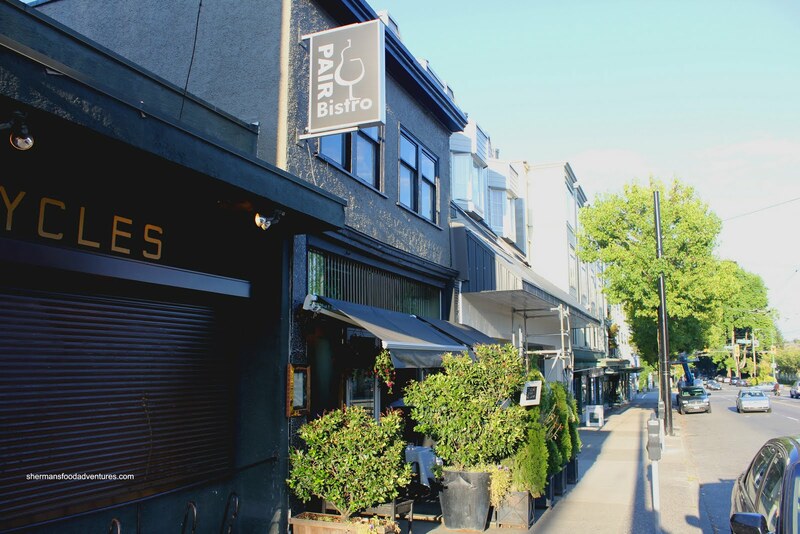 Pair Bistro out on 10th at Alma would not be the usual choice for many people partly because where it is situated and also the fact it is not really that well-known either. Hey, if it weren't for Mijune, I would be one of those people! Heck, I've driven by this place so many times and probably walked past it too! Shows how observant I am... Meeting up for a meal with Costanza and Elaine, we were seated on the small outdoor patio. Funny how we seemed to attract all types of insects as a fe w bees were very interested in our food. But it wasn't as funny as the spider that kept sliding down on its web from the front awning. I swear it was trying to sample all of our dishes! Wait, that would be me too. Am I an annoying spider??? Well, Viv does say I'm too busy with my hands... Er... TMI! 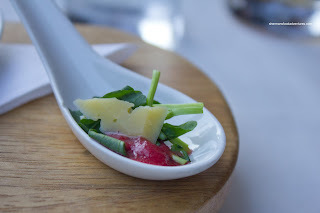 As for the aforementioned food, we were first presented with a small Amuse Bouche consisting of watercress, sour cherry dressing and tomar cheese. This was very simple and light with a bit of peppery notes, zing and nuttiness from the cheese. 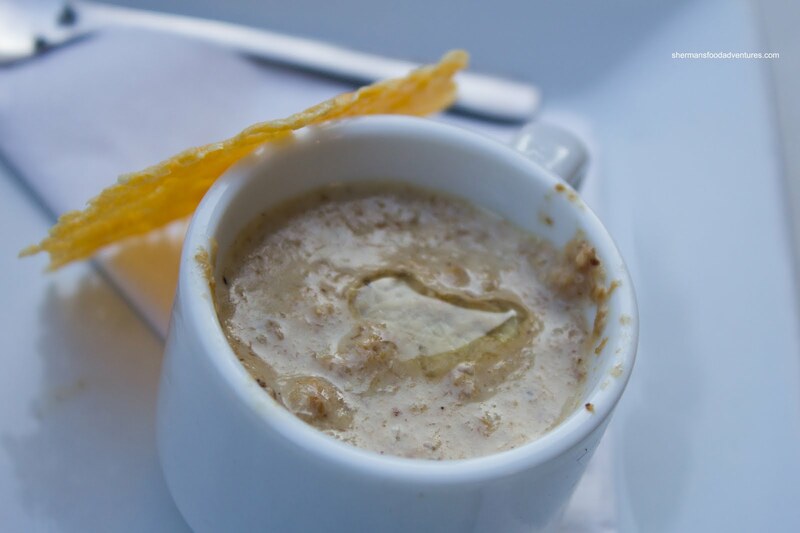 For her starter, Elaine decided on the Wild Mushroom Latte topped with truffle oil and asiago tuille served on the side. This tiny cup of soup really packed quite the flavour punch. It was as if we did a face plant into the ground from the Earthiness provided by the mushroom and truffle oil (as stated by everyone at the table). For me, I thought woodsy would be a better description. It felt like I was licking the bottom of the forest floor, in a good way that is. It was actually the right size due to the creaminess. Not sure if one could have a bigger serving of the soup. 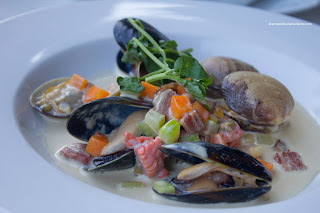 On the topic of creamy, the Saltwater Chow der with Gallo Mussels, Savoury Clams, Wild Boar Bacon and Chilliwack Corn Potato Cream was visually appealing and rich. The cream "soup" was really thick and sweet. There was so little of it, I'm not sure if it qualified as a soup or chowder. It was more like a creamy sauce which benefited from sweetness of corn and the smokiness of the boar bacon. The Mirepoix (without the onions) was vibrant and still slightly crisp. Love the use of mussels and clams in the shell. They were plump and sweet. Costanza ended up with a First Nations classic in the Native BC Bannock Bread with cottage made preserves and cedar jelly. 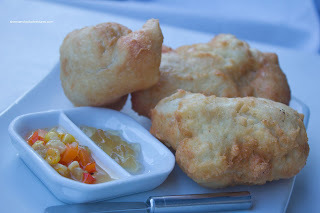 I've had many versions of bannock including my own and I'd have to say this one was pretty darn good. It was fried perfectly (not being too greasy) with a dense, yet still fluffy interior. These were served pipping hot and went well with the jelly. We only wished we had more jelly! This was a very filling "appetizer" and really should be shared with others. Can't imagine dusting that all off and then being able to eat a whole meal! Wait, I forgot, Mijune could probably do that. As if that was filling enough, Viv's Fraser Valley Duck and Apricot Pate was equally heavy for an appie. Served on the side were dried figs and apricots as well as La Baguette artisan bread on another plate. 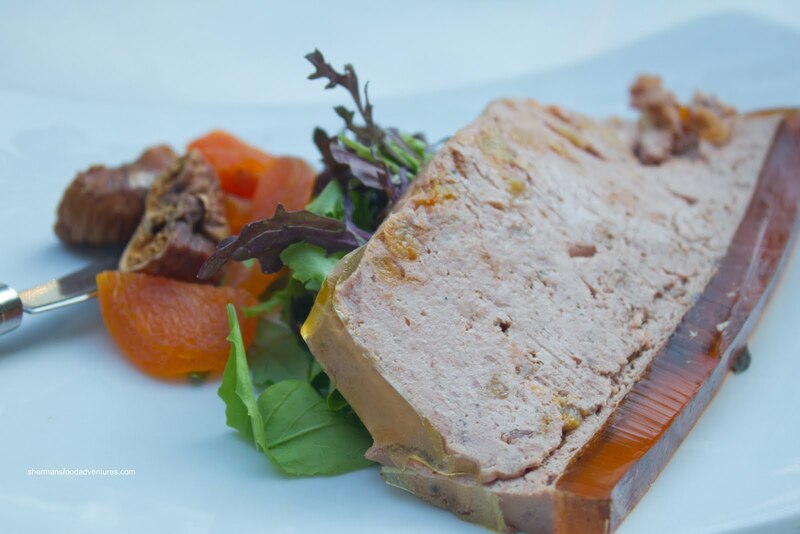 Not that the pate was particularly heavy, rather, it was a fairly large portion with plenty of accompanying bread. The pate was pretty smooth with the occasional apricot which gave out a nice sweet burst and a touch of texture. There was a delicious duckiness which was not gamy. The dried fruit was disappointing though. It was very hard to chew through the fig since it was quite hard and dry. Moving onto the mains, I had the Peace Region Bison Ribs with wild blackberry BBQ sauce, Chilliwack corn bread and radish slaw. The slow braised ribs were fall-off-the-bone tender. Now, to be accurate, they weren't melt-in-my-mouth tender though since bison ribs would never achieve the same texture as pork. 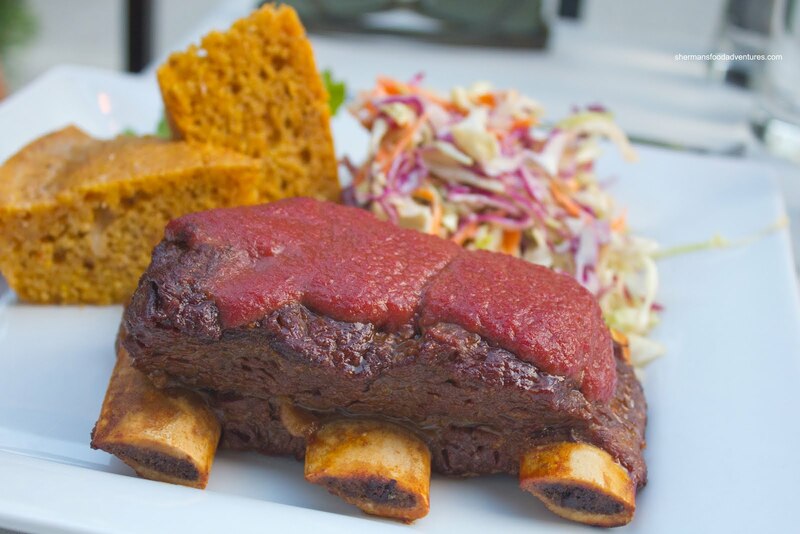 Think tender beef brisket or shortrib, except more moist and you'll get the idea. Even without the BBQ sauce, the meat was flavourful and rich. I found the BBQ sauce to be quite mild and slightly sweet which didn't interfere with the meat. I'm not sure if this was the intention, but it worked. As for the corn bread, I loved the sweetness, yet wasn't that thrilled with the dryness. If it were a tad more moist, it would've been perfect. Although the slaw was crisp and fresh, it could've stood for more acidity. Viv opted for more meat, in addition to the pate, in the form of The Burger. It was tantalizingly described as naturally-raised grass fed 1/2 pound of Pemberton Meadows Beef with smoked cheddar, wild boar bacon, foraged mushrooms, organic greens and roasted garlic with a Pair pickle. And it arrived as advertised, majestically large with sea asparagus peaking out from underneath the greens and above the large beef patty which was moist and juicy. The onion in the burger patty added a nice sweetness and texture while the boar bacon could've stood to be done more crispy. It was rather fatty and chewy. 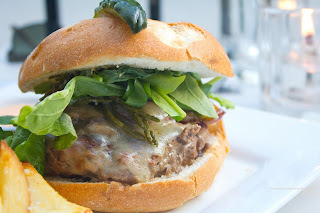 I really loved the bun, it was soft, crisp and airy. The accompanying thick-cut fries were crisp outside while soft and potatoey on the inside. Reminded me of Red Robin actually, but better (duh...). We were not sure what was served as a dipping sauce for the fries though. It looked like chipotle mayo, but it had no real flavour and was quite watery. Without even being prompted, Costanza and Elaine ordered the Feast Platter for a PAIR. I was secretly hoping that they would! Such cooperative dining companions. Even better because I got to try everything! Damn, I really am a spider, with my hands in everyone's food! Anyways, the first item I tried was the rosemary pepper crusted Wapiti Elk Medallions finished with a chocolate & sour cherry jus. 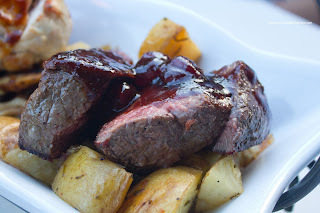 The elk was cooked perfectly medium-rare which allowed it to remain moist and tender. There was plenty of meat flavour without being gamy. The jus was quite mild with just a hint of tart and bitterness. Up next was the Maple Hills Farms Free Run Chicken which was prepared as a roulade stuffed with UBC spinach & foraged mushrooms. It rested on apple cidar glazed veggies and finished off with wild flower honey & sage demi. I found the chicken itself to be super moist and juicy. Although the overall flavour profile wasn't smack-in-the-mouth impactful, there was enough subtle hints of sweetness from the stuffing and sauce to season the meat. The still crisp veggies underneath were very good. Good combination of sweetness and acidity. The one blip in the platter was the Sockeye Salmon. 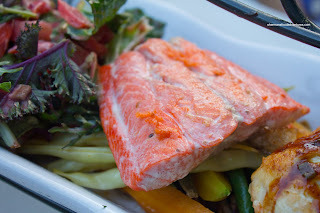 I realize it is a bit difficult to prepare sockeye salmon so that it remains moist, however, this piece was dry and bland. Don't get me wrong, it wasn't terrible. In fact, it was a beautiful piece of fish. Too bad really. The last item on the platter was a Wind Dried Salmon Candy resting on a bed of UBC field greens. The flakes of salmon candy were moist and sweet. It went well with the fresh greens. After a decent amount of food (with some of it heavy), we decided to share 2 desserts. Costanza and Elaine chose the Blackberry Galette served with peppermint ice cream. 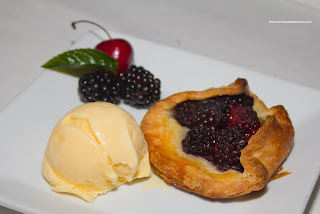 Although the pastry was flaky and crisp, the blackberries were far from sweet. In fact, they were quite sour. Add in the peppermint ice cream with the sourness and the whole thing really didn't work. Fortunately, the dessert Viv and I selected was much better. 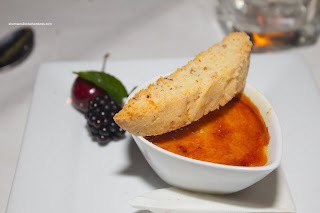 We swore that the server said it was a Sour Cherry Creme Brulee, but we didn't get a sense that it was. Maybe we heard wrong? Whatever the case, the custard was not too sweet and indeed custardy. The best thing was the caramelized sugar topping. It was thin, crunchy and smoky sweet. It was perfectly executed. The small piece of biscotti was crumbly and soft, which suited us fine because we didn't have coffee to dunk it into. Apparently, our server forgot Viv's coffee. Costanza got his though. However, the service overall was fantastic - attentive and courteous. The food in general was pretty solid with a few gems. 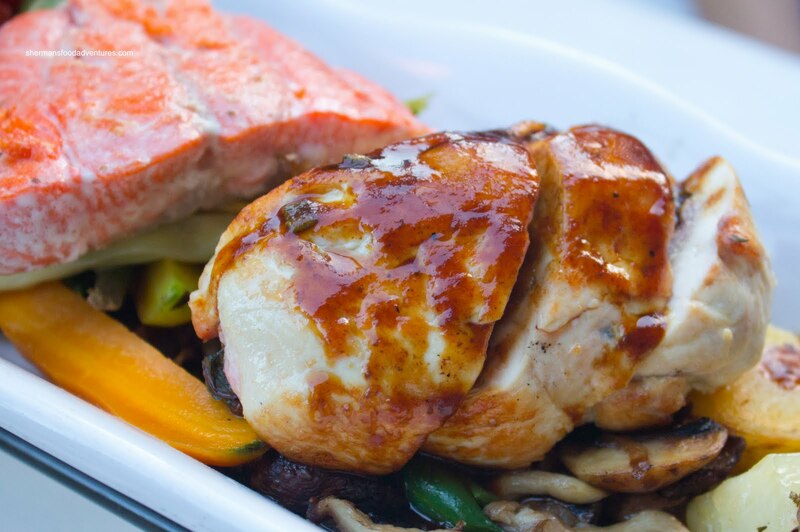 Pair Bistro should definitely be in consideration when one wants a solid meal at a place not subject to any hype. @Kevin Hmmm... Maybe they'll be as twisted as I am?